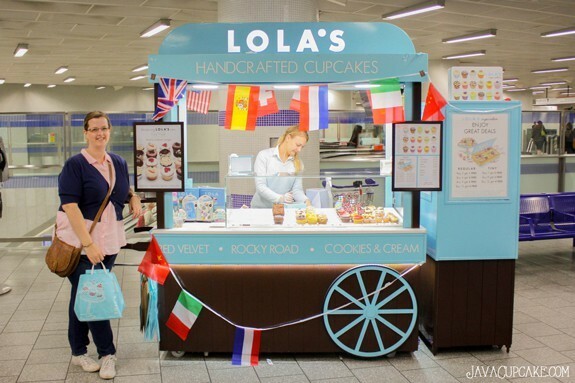 Located in one of the oldest, busiest, most famous Underground stations in London, Lola’s Cupcakes operates one of several remote kiosks selling their American-style cupcakes to locals and travelers! I found Lola’s Cupcakes almost by accident. As we were heading back to the our hotel for the evening on our last full day in London, My husband casually says to me, “Hey, did you see the cupcake stand over there” as we’re coming up the escalator in the King’s Cross Station. I was like “WHAT?!?!?! Cupcakes?!? WHERE!!!??”. I pretty much dropped everything I was doing, stopped caring that my feet were hurting from being on them all day and RAN to the kiosk that was selling cupcakes! I don’t know about you… but the first time I enter a new cupcake shop I go into a bit of a frenzy. Maybe it’s the food blogger in me super excited to capture and share what I’m about to experience, maybe it’s the baker in me excited to try someone else’s confections, maybe it’s just the little kid in my excited for cupcakes! Whatever it is, the moments I spend in a cupcake shop for the first time is like an adrenaline rush, a high, an excitement that compares to nothing else! 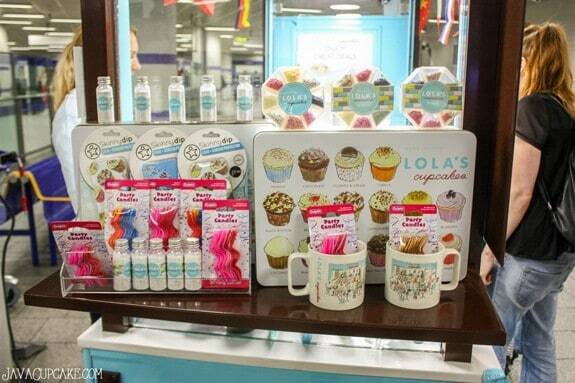 The first thing I noticed at Lola’s were, of course, the cupcakes! It was late in the day, yet I remember being impressed that they still had a selection of various flavors, both full size and mini, to choose from. 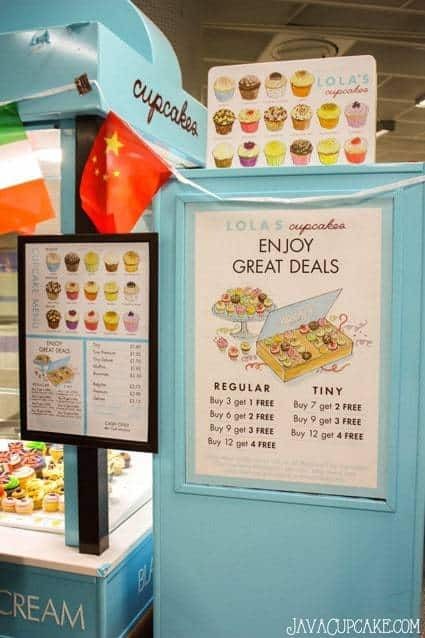 On a typical day, Lola’s carries 16 different varieties of cupcake flavors… quite impressive! 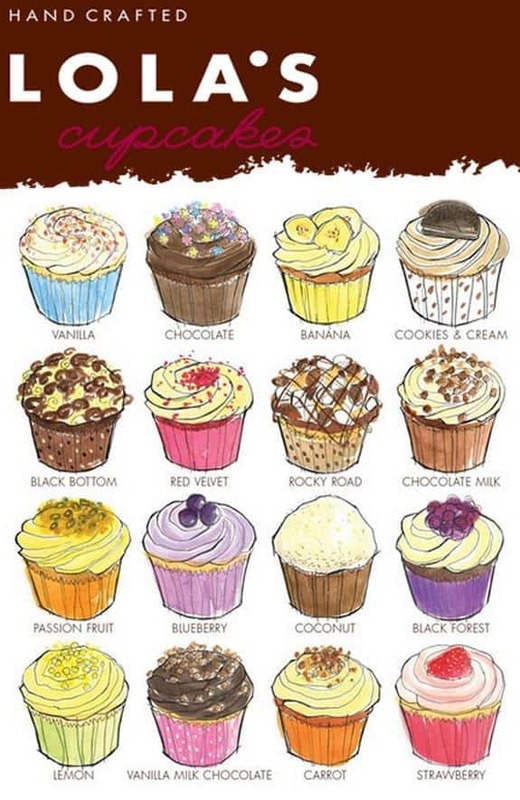 Here’s a super cute graphic from Lola’s website that shows all the different flavors of cupcakes to choose from! I only wish I had more time to try more than the two I picked out! The cupcakes kiosk was so cute too! Their blue color is one of my favorite colors so I instantly was drawn to it! One of my favorite things about Lola’s kiosk was that not only did they sell cupcakes, but they also sold coffee mugs and other cupcake related goodies! I love it when a cupcake shop has souvenirs I can bring home with me! Since it was the end of the day and my husband and I were stuffed from all the food we had been eating, I picked out two mini cupcakes to taste test. I chose Raspberry & Black Forest… one vanilla base and one chocolate base. I can really get a feel for the bakery by trying at least the vanilla and chocolate cupcakes, so if I was only going to eat two, then those were going to be the ones! It wasn’t until we got back to the hotel that I was able to taste the cupcakes. So I apologize for the lack of tasting photos and the poor lighting! Hotels don’t make for the best photography studios! There really isn’t much more to say about these cupcakes than this… WOW! For being the end of the day, these cupcakes were NOT dry. In fact, they were super moist and so super good! The chocolate cake on the Black Forest cupcake was really delicious and topped with a cream cheese frosting, it was just the perfect combination of flavors. 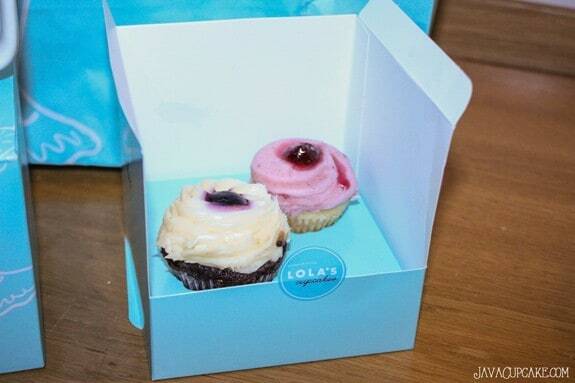 I’m not typically a huge fan of vanilla cupcakes… but the vanilla cupcake at Lola’s actually tastes like vanilla! It was moist, had a fine crumb and topped with the raspberry buttercream was a perfectly sweet bite of cupcake! 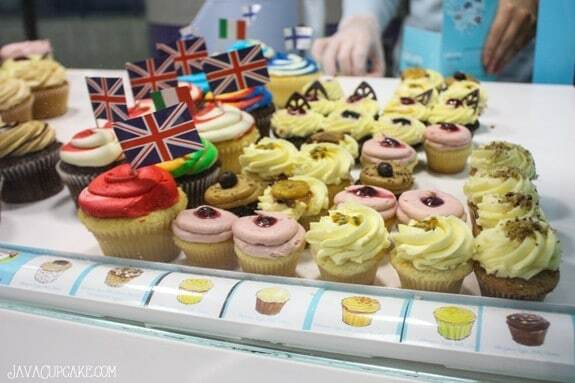 If I had more time in London, I would definitely stop in one of their stores and taste test more of these cupcakes! If I was this impressed by two mini cupcakes from kiosk in an Underground station, just imagine how amazing the cupcakes should direct from their bakery! 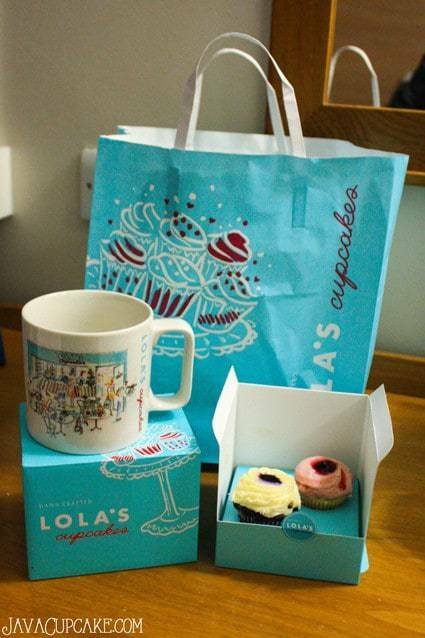 So if you’re in London, I definitely recommend trying Lola’s Cupcakes! They have 11 locations to choose from including King’s Cross (where I found them), at Selfridges and at their main Mayfair location! In case you missed it… last week I shared about my visit to The Hummingbird Bakery and announced a giveaway to go along with my reviews! I’m giving away a little swag I picked up along my travels to one lucky reader! 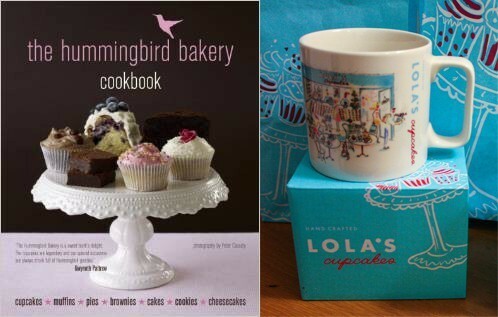 One person will win The Hummingbird Bakery Cookbook and a Lola’s Cupcakery coffee mug! Simply fill out the form below! You must be 18+ to enter and have USA or Europe mailing address. Each week, with each new review, you’ll have a chance to enter again to win! So keep coming back or head back to last week’s review & enter there too! I think I would try the blueberry one first. I’m always curious to see how people handle the flavor. ooooh those cupcakes look and sound amazing! I’m a huge coconut fan so I’d go for that one. I’d love to try their coconut cupcake!! I would love to try the banana cupcake. I don’t think I’ve ever had a banana cupcake before. Far and away the Blueberry cupcake would be first. Your descriptions were spot on, I could almost taste them.. Yum! I would try Black Forest or coconut. I would love to try the black forest cupcake. That is my favorite flavor combo! Coconut would have to be my first go. This place looks great! Always fun to read about your adventures. I’d love that Black Bottom cupcake! would love to try the black forest. Always a sucker for good chocolate! I would like to try the black forest cupcake. On my second visit there, I’d try a lemon flavor! I’m loving your reviews of the London cupcake shops. My husband is from England. He has been in the states many years and one day we hope to make a trip “across the pond”. Thanks for giving me a peek of what I have to look forward to! I would definitely try the blackbottom…one of my favorite cupcakes! I don’t think I have ever tried passion fruit of any kind, so that would definitely be my first taste !! The vanilla I think… It’s my favorite! I ordered a Birthday Cake and some cupcakes from LOLA’s for my wifes Birthday. The 9″ Chocolate Hazlenute Cake and 6-cupcakes were superb. The cupcakes were brought to my wifes office and have set a new standard in baked goods. They will be well challenged to meet it or beat it.